One of the most important functions of EQUAL MEANS EQUAL is to educate the public about the Equal Rights Amendment: what it is; why we need it; and how it would help American women, girls and families. There is no denying the power of celebrity to reach groups of Americans who may never have heard about the ERA; EME believes that public media, outreach and PR are critical components to winning ERA. THANK YOU to Academy Award winning actress and activist Mira Sorvino for standing with EQUAL MEANS EQUAL and supporting equality for all Americans and the ratification of the ERA! Photo credit and special thanks to EME Teammate & award-winning photographer Jill Greenberg for making it happen! On November 9, 2018 #VAratifyERA launched the “10 Days of ERA,” statewide bus tour helmed by Delegate Jennifer Carroll Foy (D) and Senator Glen Sturtevant (R). 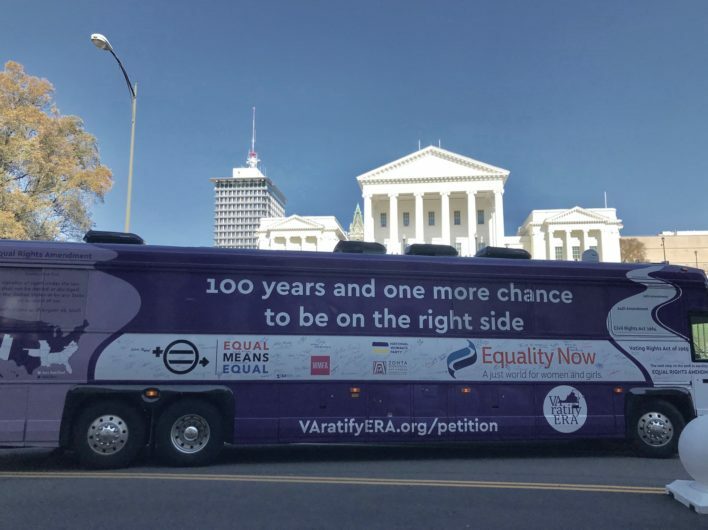 The tour’s goal was to educate Virginians about the absence of gender equality in the U.S. Constitution and highlight the unequivocal, bipartisan statewide support for ratification of the Equal Rights Amendment (ERA). Two states ratified recently, Nevada in 2017 and Illinois on May 30th, 2018 leaving just one state left in the 38 required. All eyes are on Virginia to be the last, historic state during our next General Assembly session. The tour kicked off with an EQUAL RIGHTS AMENDMENT law symposium at William & Mary’s Marshall Wythe Law School (EME’s legal counsel, Wendy Murphy, was one of the speakers) and concluded with workshops in Richmond. The bus travelled over 1,500 miles with events targeting sixteen Virginia colleges in Ashland, Blacksburg, Charlottesville, Fairfax, Fredericksburg, Hampton, Harrisonburg, Lexington, Norfolk, Petersburg, Radford, Richmond, Roanoke, Staunton, Virginia Beach, and Woodstock. Since launching the VAratifyERA campaign on August 26, 2018 (Women’s Equality Day), communities across the state have voted to support resolutions advocating for ratification. They include: Shenandoah County Board of Supervisors, Prince William County Board of Supervisors, Fairfax County Board of Supervisors, Albemarle County Board of Supervisors, and the City of Charlottesville. They join citizen groups such as the Arlington Civic Association, League of Women Voters, American Association of University Women, and the American Bar Association (ABA) which passed resolutions reaffirming support for the ERA. The ABA resolution also called on all state bar associations to actively engage in the pursuit of ratification. 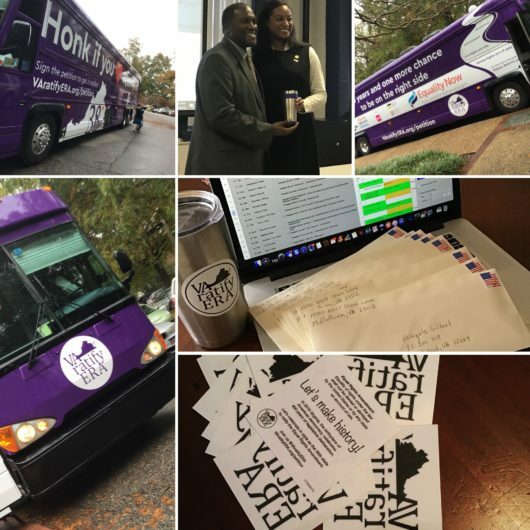 The “Ten Days of ERA” bus tour was hugely successful in raising the public profile of the ERA in Virginia, having productive public discussions about it and building support for its imminent ratification in the 2019 legislative session which begins on January 9th. We look forward to helping the activists in Virginia bring it home in January…stay tuned for when and what we’re planning! P.S. THANK YOU to everyone who donated on Giving Tuesday! We GREATLY appreciate all your kind support as we head towards the finish line!